New Winter 2018: Some of the best memories are made when the whole gang gets away from the routine to share in adventure together! 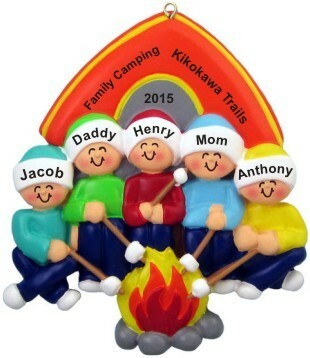 The camping family of 5 Christmas ornament personalized from Russell Rhodes is a bright way to remember exciting times shared by all. All of the lettering is done by hand in a handsome font, so you’ll receive a family ornament personalized to be an instant favorite that will grow more precious with time. This personalized camping ornament is affordable too and arrives in our exclusive velvet gift bag. Remember those wonderful moments forever with the family of five personalized Christmas ornament!